The kopschop-incident refers to the assault by eight alleged offenders on an innocent victim in the city of Eindhoven on January 4, 2013. The CCTV footage of the incident, which included the assault that was released to identify the eight suspects caused moral outrage in Dutch society. This in turn resulted in attempts by digital vigilantes to identify the suspects online using social media platforms. The suspects eventually turned themselves in but received low sentences. According to the judge the suspects were already punished by the excessive media attention and the harassment by vigilantes. Thematic analysis allowed this thesis to analyse how aspects and patterns of digital vigilantism were manifested in the dataset and how they recurred throughout the dataset. Digital vigilantism was broken down in four themes. These four themes were; moral outrage, the call for identification, the call for justice and distrust in the police. These themes derived from various studies done on digital vigilantism. 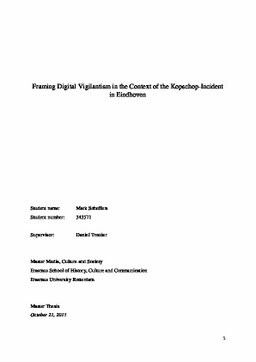 Cultural embedded framing analysis focussed on the biases of the media platforms and how they emphasised certain aspects of the kopschop-incident and its aftermath in order to construct the story of the kopschop-incident. Five types of frames; values, narratives, myths, archetypes and stereotypes, were used to analyse the dataset. Each type of frame in turn was further conceptualized using various literature. Results of the analysis showed that GeenStijl actively participated in digital vigilantism by openly naming and shaming the suspects with disregards to their privacy. Strong language and threats were used to emphasize GeenStijl’s discontent towards the suspects and criticism to the breach of 3 privacy of the suspects was heavily criticized. The policies and actions by law enforcement were also criticized and the blog showed discontent regarding the low punishments that the offenders received. De Telegraaf showed a more nuanced and objective tone towards the kopschop-incident. De Telegraaf condemned both the actions of the suspects and of the (digital) vigilantes. The newspaper did not use threats and bad language but reminded the audience of the nature of the kopschop-incident and the public outrage that followed. De Telegraaf highlighted criticism of the suspects and their lawyers, the victim and public figures regarding the conflicting policies of law enforcement, the privacy infringement of the suspects and the sentences that the offenders received.